My friend is a parent of a child with CVI with visual recognition problems. On the CVI Range, he scores in Phase III (Roman-Lantzy). She constantly describes the impact of CVI on her son that she witnesses every single day. These children with visual recognition problems due to CVI have really, really good central vision use that is consistently used. Because they are looking, people think they have visual access just like we do. This is her story about a family trip to Montreal. Of course, Omer really doesn’t care for these adventures into noisy, busy and new environments where objects and people are not known and therefore not understood. CVI is an issue of visual recognition after all. He wants to stay in the hotel room that is quiet with few people moving around. He understands and can visually predict the bed, bureau, TV and chairs. He knows the people in the room are his family so that reduces the stress. Because the family understands this difficulty, they picked a quiet restaurant for lunch. On the table at the quiet restaurant, Omer he saw a glass of room temperature water with bubbles. For kids with CVI and visual recognition problems, it takes so long for them to visually process newly seen events and materials. Omer was working so hard to close the gap of information that he missing. He is desperately trying to link previous information to this novel visual target. 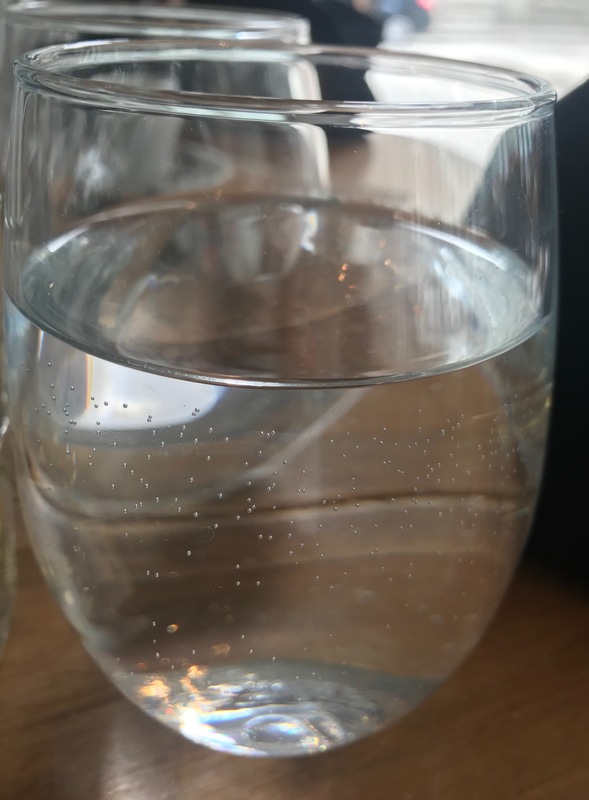 Omer never saw the bubbles in a glass of water before. It was his first time seeing it and he was fascinated! He asked his mother to take a picture of it so he could zoom in for a good look and verbal explanation. I am so proud of Omer’s advocacy! What I do worry about is what is number of times in his day that he encounters items, people and events he doesn’t understand and the we, with perfect vision, forget to make accessible? Vision is the primary learning mode for children with perfect vision. Vision gathers information quickly, links previous learning to new learning and links information from all the other senses for a full and complete understanding. We know that for children with CVI, vision is the primary disability. For children with CVI, their visual impairment impacts all access to all of the general education curriculum. Their visual impairment impact all access to all of the special education curriculum. Identifying the student with CVI and determining eligibility as “Vision” ensures that a teacher of students with visual impairments is part of the team and that there is consideration of the Expanded Core Curriculum. The Expanded Core Curriculum addresses the Unique Disability-Specific Needs of a child with a visual impairment. Their lack of visual attention and visual recognition limits the effective gathering of information about how the world works. Their lack of visual attention and visual recognition limits the effective gathering of information about how the people in the world behave. Their lack of visual attention and visual recognition impacts their connecting, categorizing and classifying of information. Their lack of visual attention and visual recognition limits their understanding of sound sources. Their lack of visual attention and visual recognition requires direct experiences in natural environments. This is not an extra curriculum. This is an essential curriculum for the child with visual impairment. These are skills that everyone needs to live and work successfully to their full potential. The critical difference for our children with CVI is ACCESS to these 9 skill area. Children with perfect vision begin their exposure to the Expanded Core Curriculum at birth. Children with CVI must have the same consideration. Children with and without additional disabilities can have Expanded Core Areas addressed in their programming due to the absence of or reduction of incidental learning. lack access to all visual information which optimizes all the learning for their peers with perfect vision. lack access to the same number of repeated opportunities for visual information to reinforce concepts which optimizes all learning for their peers with perfect vision. lack access to visual experiences to link new information to old information which optimizes all learning for their peers with perfect vision. lack the ability to access and practice continuously in naturally occurring environments which optimizes all learning for their peers with perfect vision. 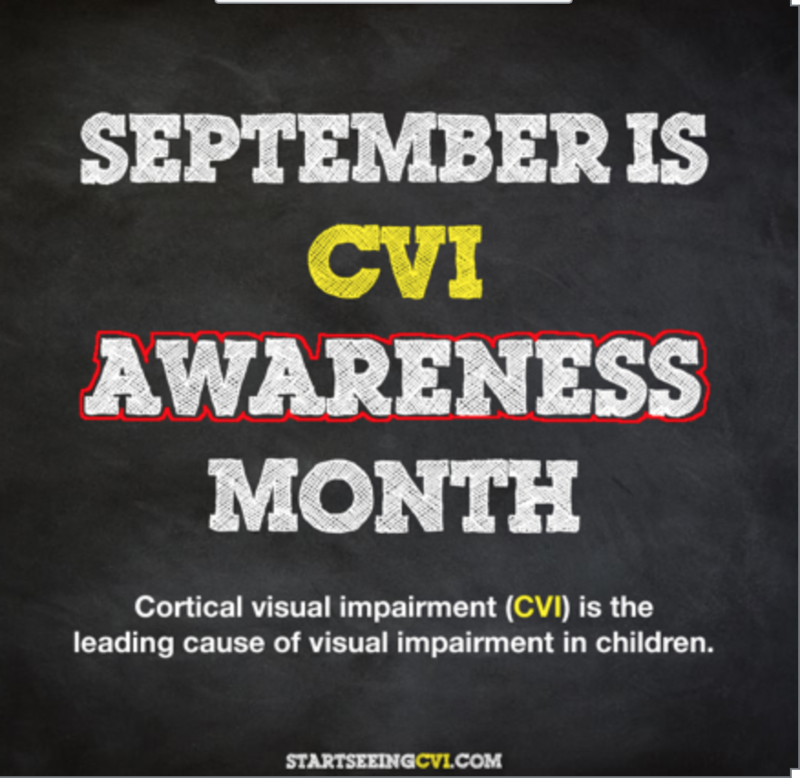 CVI is a neurological condition but is manifests in a visual impairment. This visual impairment is the issue for all learning. For the eligibility section of the IEP, chose “Vision” and the primary disability and “Neurological” as the secondary disability. Bring Vision to the forefront for all learning. This is a great podcast by a reading specialist putting ideas directly into practice for her grandson with CVI. Another wonderful podcast from Kaleidoscope by Jessica Marquardt. The caseloads for TVIs are large and overwhelming. I have been a TVI for 40+ years so completely understand that. I think the danger in deciding the student with CVI deserves less direct and consult service than the student learning Braille is the problematic thing for me. It gives the feeling that the children with CVI are not really visually impaired. You know, of course, that is not true. That type of thinking is driving some states to mandate service to Braille students while writing policy to only serve student with CVI monthly and only in a consult model. This shows a great lack of understanding of CVI as a visual impairment. It ignores all the building evidence of visual improvement due to visual neuroplasticity. We should be making service decisions based on children’s functional vision and based of children’s assessed need. Dangerous stuff when we start separating students needs based on the location of the condition location: eye or brain. It limits the professional determination for direct and consult service based on assessed functional, individual needs. We do not determine service based on the fact that the child has an ocular or cortical/cerebral diagnosis. Not now, not ever and certainly not when the population numbers of students with CVI continues to explode. Here is a link to instructions for how to remove the background complexity in photographs. This was shared by a colleague here at Perkins. As Matt says: “Teaching and supporting children with CVI is a richly rewarding experience that requires a joyful, fervent commitment to continuous learning. Fortunately, our field has many wonderful mentors who have dedicated their careers to furthering our understanding of CVI. In this conversation, I will share an integrated understanding of their ideas in the hope that such an approach will enrich your CVI journey as it has enriched mine”. We are all on the path to learning more about CVI. Matt shares his journey and idea here! Spread the word! CVI Awareness! Awareness is the first step in advocacy! For those not familiar with the color highlighting around words like “AWARENESS” in this sign, this is a method developed by Dr Christine Roman-Lantzy. It it meant to draw the visual attention to the word shape and salient features. Although in this example all the words are capital letters, you would not use all capital letters in reading programs with students. This wonderful blog is by the mother of a child in Phase III who has CVI. It cautions us to “check in” to make sure the subject of our language and the materials for learning are well understood by the child. We understand this so well for our students with ocular impairments but for children with CVI who appear to be looking, we must be very diagnostic. Are they understanding the concept fully or understanding what the learning materials represent? For children with CVI, looking is not always understanding what is seen.